Convenient discount parking is available near Union Square Park and the Union Square Subway Station at the following Parking.com locations. Click on a location listed in the map below for daily/monthly parking rates, garage information, or to print a discount coupon. Please note: Customers must present coupon at time of exit to redeem discount. 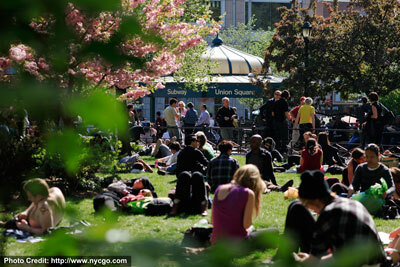 Union Square Park is located near the Flatiron, Chelsea, Greenwich Village, East Village, and Gramercy neighborhoods of Manhattan. A greenmarket is offered at the park several days a week, selling fresh produce and goods by local vendors and farmers. Many of these items are featured on the menu of the market cafe, located at the Union Square Pavilion. Union Square is also known for its holiday market, which allows visitors to purchase collectibles, jewelry, and artwork from over 100 craftsmen. Parking.com has convenient parking throughout the NYC metro area! Click to find more Chelsea, West Village, Greenwich Village, Gramercy, SOHO or simply NYC Parking.